Please note that the shop will be closed from April 24th until May 5th. All orders must be in by 8AM on April 24th if they are to be shipped in a timely manner. Check the new “Incoming” area on the sidebar. Media Mail Shipping to USA! New Arrivals and Restocks from Black Psychosis, Dead Gods, Found Remains, Menstrual Recordings. PRIMITIVE ISOLATION TACTICS will also be performing at this year’s edition of the Vancouver Noise Fest alongside other Absurd Exposition alumni GRIEFER, THE NAUSEA, THE RITA, RUSALKA, TASKMASTER, K.M. TOEPFER, WORKER. April 27th at The Remington Gallery. Event link here. Please scroll down for this week’s New Arrivals and Restocks. 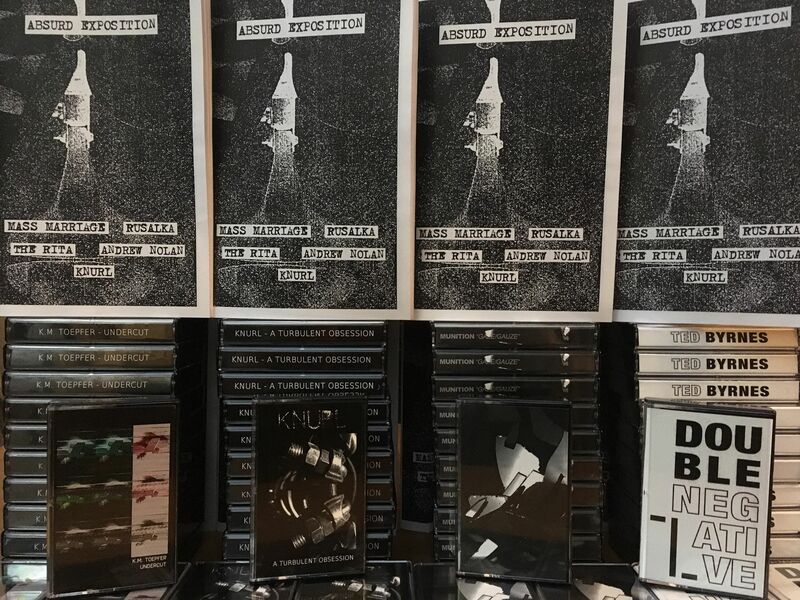 New Releases on Absurd Exposition. Tapes from K.M. TOEPFER, KNURL, MUNITION, TED BYRNES and a zine are available now. Full release details below. Tapes are CA$7 and the zine is CA$5. Look for the bundle deal if interested. Labels and distros can get in touch for trades and wholesale. 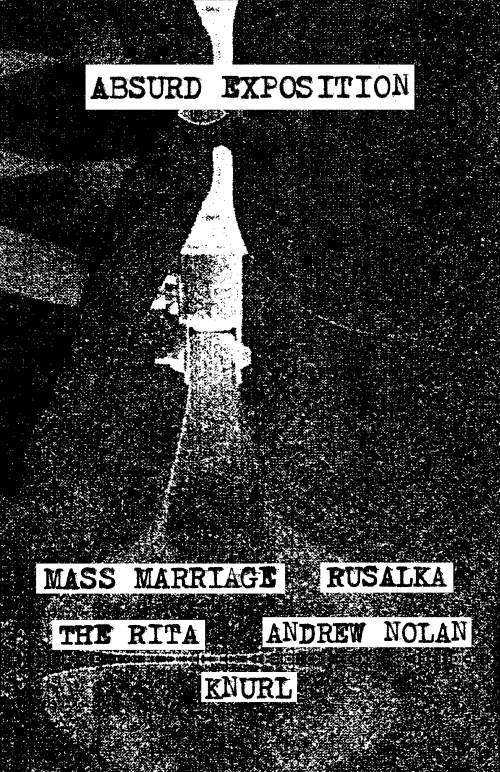 Interviews with MASS MARRIAGE, RUSALKA, THE RITA, ANDREW NOLAN, KNURL. Edition of 100. 40 pages, black and white, A5 size. Sparse flutter. Disintegration. Something doesn’t sound organic. Is the hard drive skipping? Digital rain pattering on a digital roof. Compressed downpour. The user’s screams as the programmed acid rain starts to decompile the up-linked mind. The howls of distant coded wolves hiding in the pixelated forest. Blocks of greens and blacks. Numbers. Someone – no, some-thing is scanning you. You are lost. There is no hope here. Wherever “here” is. An eternity inside the machine. Never a way out until the processor sputters. Flatline. You’ve been deleted. You wake up. The Inner Light. What is real? What is not? Analog and digital become homologous. You scrub the data. You wipe the slate clean. Erase the tape. Burn the pages. You forget the life you’ve just lived. You try to get on with the day to day. Creating harsh noise under the POTIER. 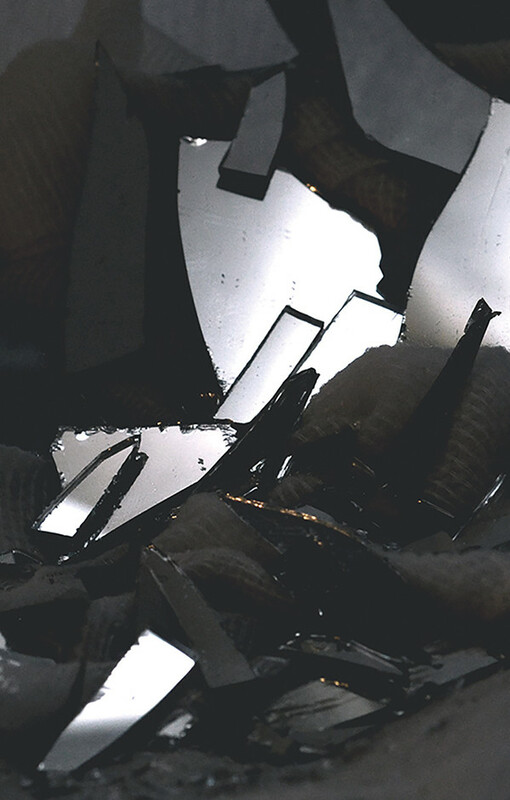 moniker from the mid-2000s through to the mid-2010s, K.M. Toepfer has since turned to establishing experiments in his new frontier of raw image data and audio manipulations, as showcased on releases via his own Lead Lozenges label, and the processing of micro cassette feedback and white noise – culminating in the sounds presented here. C30. Edition of 101 pro-dubbed on black tapes with paper labels. Includes download code. Download includes PDF artwork. For the past 25 years Alan Bloor has been honing his craft of harsh noise via the deconstruction of various components of the industrial world. As KNURL, Bloor manages to recreate the sounds of the concrete jungle by making use of an arsenal of sonic weaponry that includes everything from concrete saw blades to iron rods to homemade scrap metal instruments and everyday appliances. The humming and grinding sounds of machinery are primary influences on his work. “A Turbulent Obsession” brings a car spring, a tried and true favourite “instrument”, back into the fray. Wired with guitar strings and sawed at with a violin bow, a sound is created that is at once searing and routine. It may be piercingly hot, but it’s not to worry – that’s just how this machine likes to run. 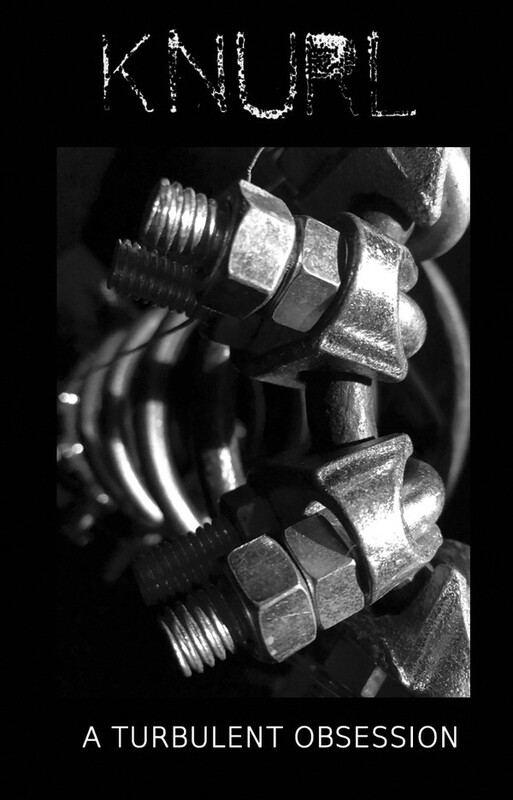 2019 marks 25 years of KNURL and Absurd Exposition is happy to celebrate this milestone with a release from an artist that remains dedicated to his industrial interests and the constant refinement of his works. C40. Edition of 102 pro-dubbed on black tapes with paper labels. Washed in waves of pulsing anxiety. The beach scene in Drive: Night. The waves crashing. The pulse of the lighthouse cutting across the shoreline and out into the sea. This pulse will cut you down if it wants to. Bathed in rays of inauspicious serenity. The final scene in Irreversible: Day. The camera pans and swirls through the park. A nauseating swirl. It’s dizzying but not only because of the motion. Something undermines the pleasantness. A juxtaposition of harmony and cacophony. All at once. Then one after the other. Fading to white. “Gaze/Gauze” traverses eerie ambient shores and sea-soaked cliff sides before building up to a landscape of washing, waxing, waning, whirling electronic assemblages. There’s a hint of martial industrial if you can catch it. Then it all recedes. The tide goes out. The moon rises. The sun sets. Again and again and vice versa ad infinitum. Everything is as it was. Everything will be as it has been. Nothing is different and nothing is the same. MUNITION is the effort of Dexter Outhit. Toronto by way of Halifax. The debut tape, “Entry”, appeared on Strange Material last year and Absurd Exposition is pleased to present this work of a promising new artist in the field. The same program repeats on both sides. 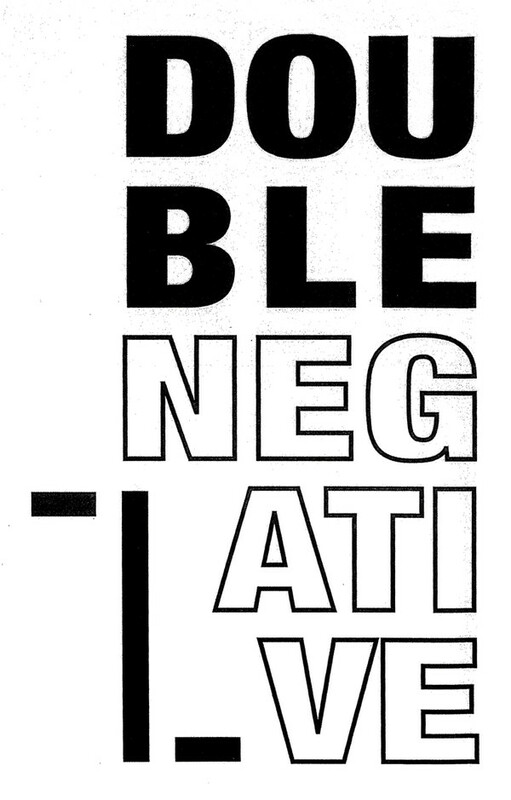 “One of the most interesting aspects of Ted Byrnes’ C16 work ‘Double Negative’ is the fact that it is presented by Absurd Exposition, which is very much an analogue electronics-based label that is most commonly concerned with ‘harsh noise’ and ‘power electronics’. The exciting aspect of Ted’s percussive work versus the electronics is its incredibly common means to an end. After years and years of my delving into the world of silicon and germanium fuzz circuits with various colleagues, contemplating the electronic processing of source into rough textures can really make someone question the various apparatuses conceptually, especially when you experience raw comparable sound via internal combustion, or in Ted’s case – percussion. ‘Striking something’ for a conceptualized sound acts as a pinnacle of deconstructed sound technique, especially when making a career out of creating seemingly percussive rough textures via electronics, can make the artist doubt their practice and its analogue gear avenues that may simply be (in extreme terms) a ‘waste of time’ when compared to straight well conceived percussion. Again, presented within the world of harsh noise specifics, Ted Byrnes’ rapid fire washes, lines and layers of shifting percussively created textures very much converse in the language of harsh noise with a vicious truth that analogue electronics may never be able to replicate. While debuting a new collaborative project, CACKLE CAR, with Sam McKinlay (THE RITA) last year, as well as ongoing collaborations with with William Hutson (including percussive work for the upcoming CLIPPING. album), TED BYRNES continues to hone his craft of harsh noise by way of acoustic percussion – both as one half of WOOD & METAL, whose “Aversions” tape appeared on Absurd Exposition this past summer, and by his own accord. Artwork by Shea Hardacre. C16. 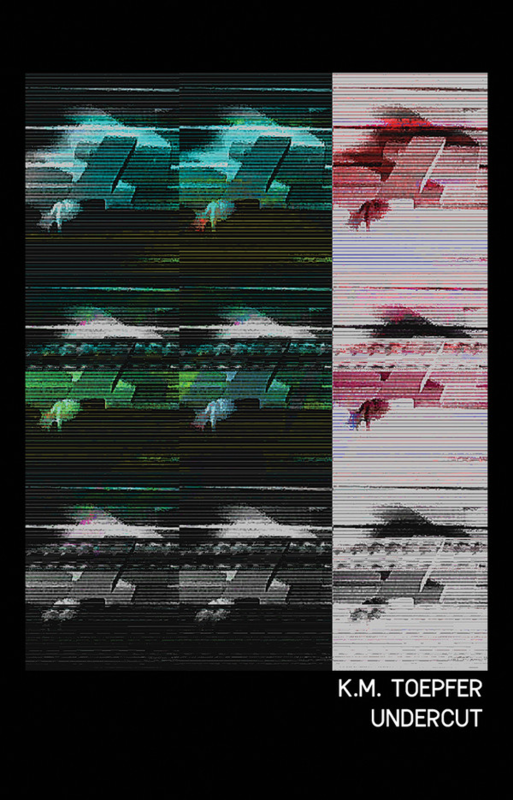 Edition of 54 pro-dubbed on black tapes with paper labels. Keeping in line with celebrating 25 years of KNURL, Alan Bloor follows up his incredible 2017 return to Montreal with a night of searing industrial deconstruction. Other out of town acts on the bill include Vancouver’s violin-based harsh noise project THE NAUSEA (“Requiem Aeternam” appeared on Absurd Exposition in 2017) and hot-and-heavy-hitters from New York state, FORM HUNTER – the collaborative junk metal harsh noise project between Stefan Aune (BREAKING THE WILL / KJOSTAD / New Forces label) and Weston Czerkies (SUNKEN CHEEK / MAGNETIC CORONER / Prime Ruin label). Rounding out the lineup is the inimitable wall of TASKMASTER, as well as yours truly (PRIMITIVE ISOLATION TACTICS). The date is March 16. The place is La Plante. The cost is $10. The doors are at 9PM.